JOZO has been adding a pinch of love to lives since 1929. Our long history has made us master the skills of mining and grinding salt to perfection. JOZO Iodised 04 coarse salt consists of courser, angular grains, which give off a lot more taste straight away because of their shape. Good for your health – iodine contributes to the normal functioning of the nervous system and normal cognitive function. The shape and size of a salt grain determine the flavor impact. That is why JOZO salt is crystallized in various sizes. 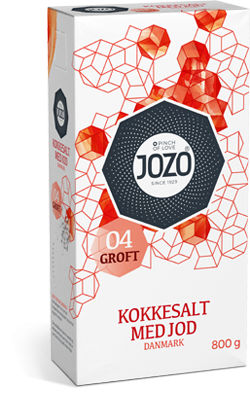 JOZO 04 salt has courser, angular grains, which give off a lot more taste straight away because of their shape. JOZO Iodised salt is one of the purest types of salt in the world. The salt is sourced in the Netherlands and Denmark from underground deposits created millions of years ago by the evaporation of the Zechstein Sea. Good for your health – iodine contributes to the normal functioning of the nervous system and normal cognitive function.